It's holiday time!! 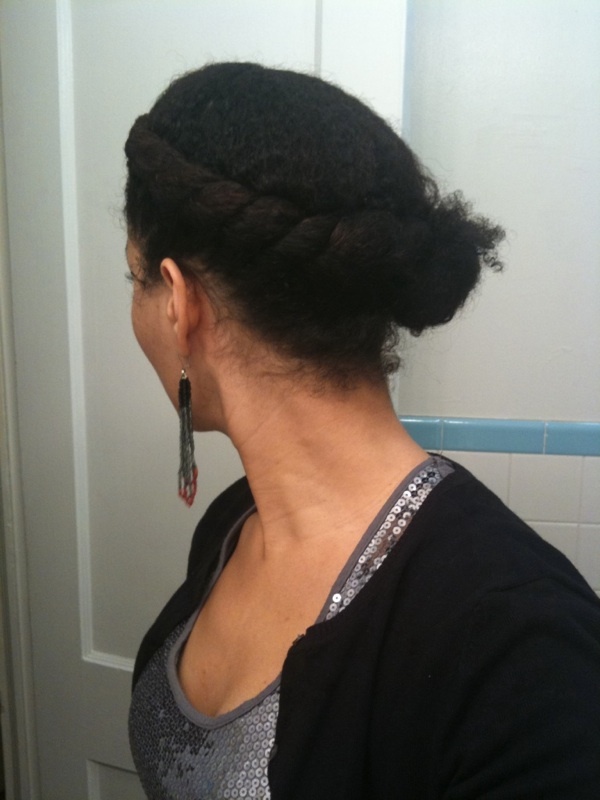 I love up-do's for the holidays. 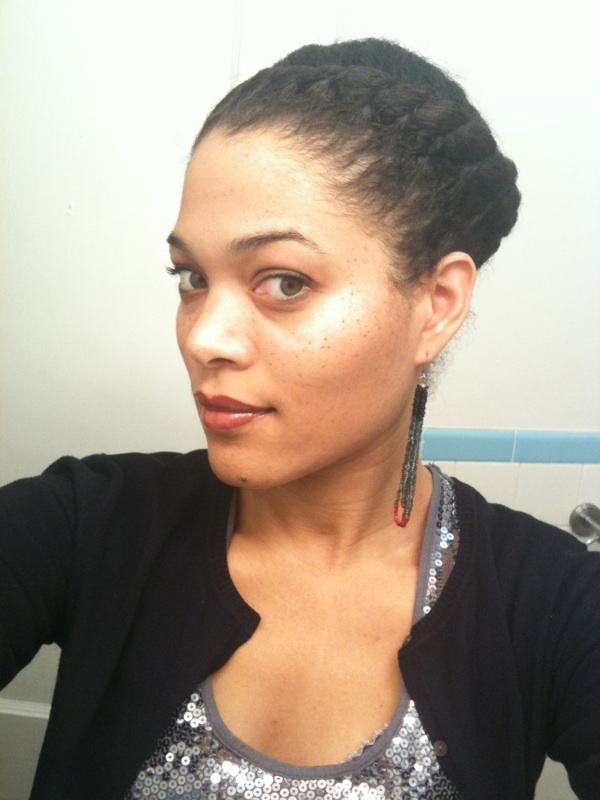 And sparkly stuff :-) Here is how I wore my hair for our company holiday party. 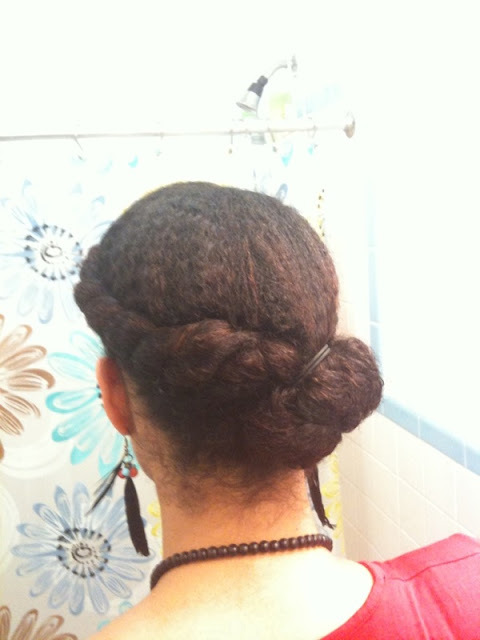 It was in two flat twists in front, and on one side the twist got bigger and bigger all the way around the back. 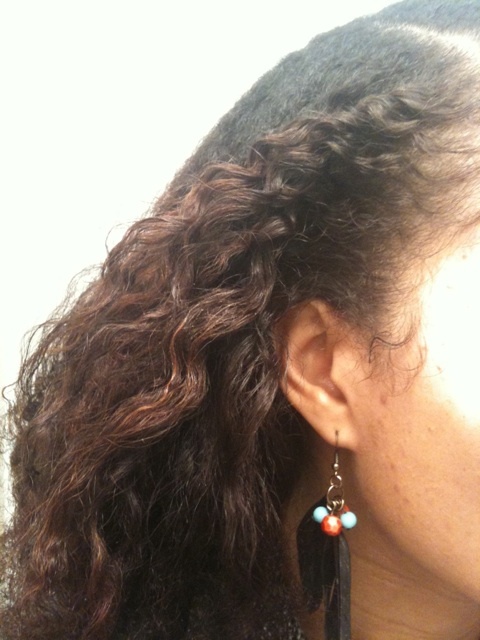 I had combed my hair out beforehand, starting from a dry, shrunken fro to give it a little volume in the big twist. I wore it like this for 3 days. And I did something dumb in that time. My girl had left a sample size packet of "Blue Magic" at my house, which I found while cleaning up. I kept it for a while to give it back to her, then it struck me one night that it was probably $.99 and I was keeping it more as a piece of clutter then for her. I looked at it and then, EVEN THOUGH I know my hair hates petroleum based products, I opened it and used it on my hair on day two- to "protect" it.... Oh it lay down pretty stiffly alright. I figured it couldn't do any bad- just perhaps no good. So thennnn. I was super curious about the take down 2 days later. Looks OK here, but it was sooooooo sticky and dry! Like parched and greasy, with all my little splits running for their lives up the strands of my hair. I did a 20 min search and destroy mission on the semi-straight hair when I got home and then put a half tub of Yes to Carrots conditioning mud deep conditioner in overnight. 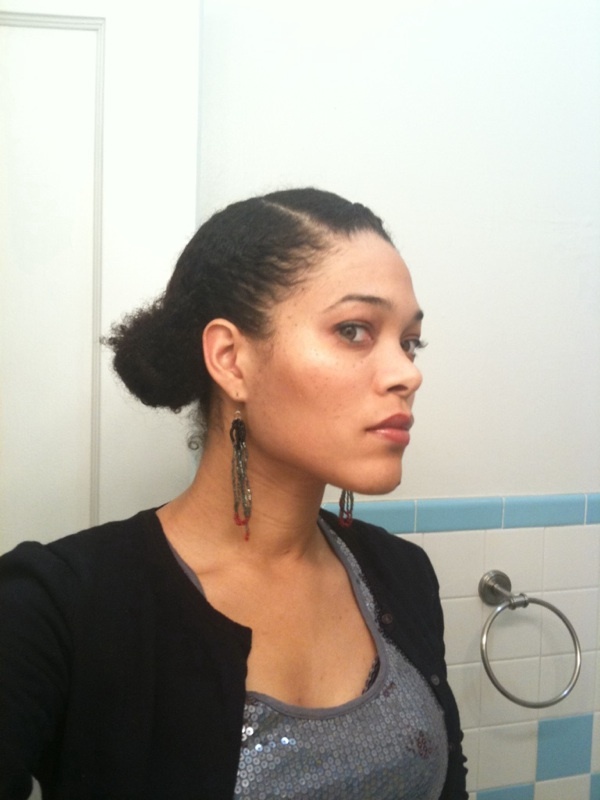 I did something completly different for my hair this week to compensate for the wrong I'd done. It includes a lot of Knot today and liquid grease lol! Next post. Just say to the petro-based ingredients. Seriously lesson learned. I like the hair. 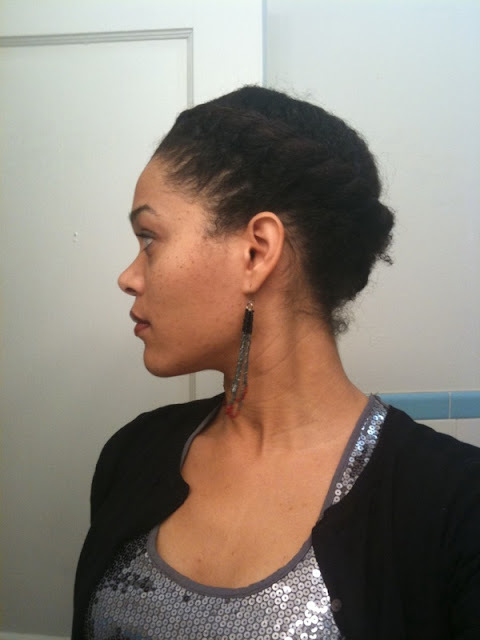 I wonder if I could do a bootleg version on my hair? And I'm confused...are you saying that you have splits that were caused by the grease? I should have expanded on the splits issue lol- it's like a 4 letter word. 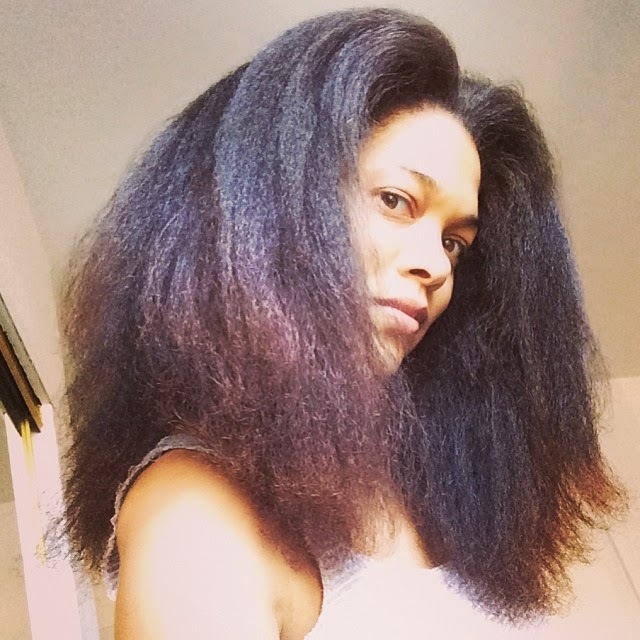 I knew I had a few (I wash-n-Go'd all summer and my last trim was early Aug), but with my ends so DRY, parched and suffocating! 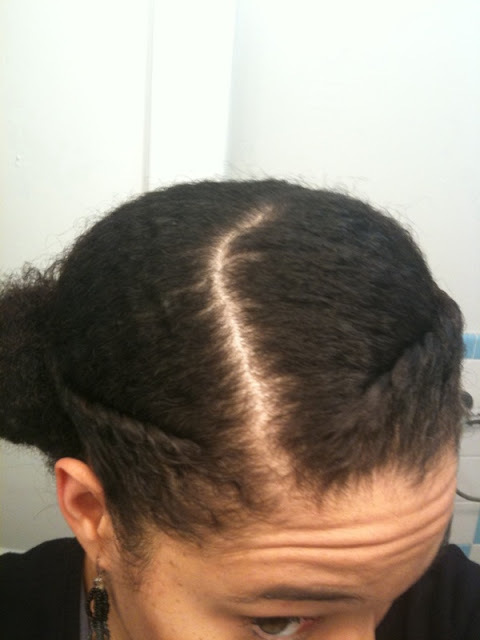 they were opening up and beginning the process of running up my hair strands. They looked super exaggerated and exposed and there were more than I thought. 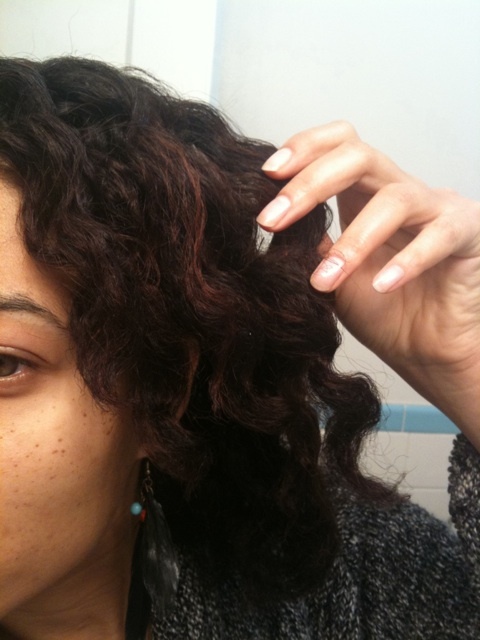 I think that when I have the ends nice and coiled up, and moisturized, that it stops their progress and disguises them (they eventually need to be cut out). 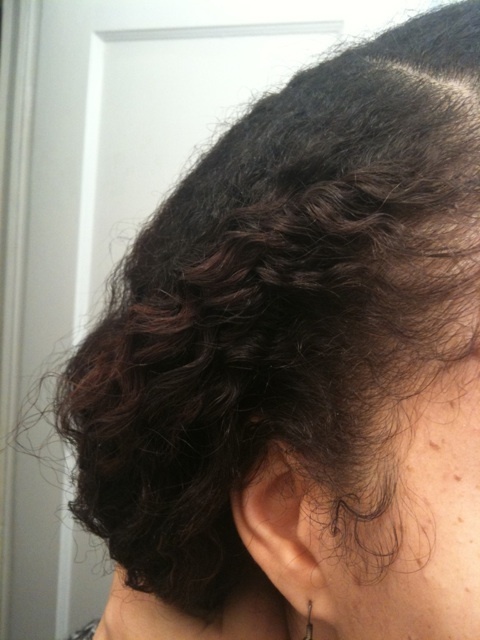 I haven't seen my ends so vulnerable in a very long time. The DC and little trimming seems to have stopped that decline in it's tracks. I'll stick to my creams and oils! I saw my strange addiction and found your girl with the perfect flat twists and I think I figured out how to do it, she seems natural but her hair is straightend (flat ironed, pressed, etc.) and the hair is actually braided into two pony tails at the sides of her head, I can't wait to try it!